Have your debit or prepaid card numbers and details ready before you apply for this card. You would get your card earlier if you have these details and fill them in straight away during your online application. This is a good card to rebuild your credit because there is no annual fee and because there is no credit checks. It is ideal as a first card for rebuilders, or if you have been denied other credit cards in your rebuilding efforts. Because there is no credit checks for this card, there are no real requirements. Nevertheless, you should have enough money in your bank account for your deposit and just make sure you use only up to 30% of your limit and pay off your bills every month in full and on time. The First Latitude Mastercard® Secured Credit Card is one of the best secured credit card to be introduced in recent times and has two great features that will help a rebuilder tremendously. Firstly, this card has no annual fee. Secondly, there is no credit checks. That means that you will be approved even if you have been rejected by other secured credit cards (yes, you can actually be denied a secured card). Rebuilders should definitely consider this card. Let us explore in greater details. There are two "great" features that this card has and I will be comparing it to cards with similar features. The first feature worth mentioning is that it has no annual fee. Most secured credit cards have annual fees that range from $20 to $50. There are a couple of cards by well-known issuers that have no annual fees. For example, Discover, Capital One and Citi all have secured credit cards with no annual fee. There are a couple more but let's just stick to these three for the moment. The second feature to highlight is that there is no credit checks for this card so if you fill in the correct information on your online application form, you are almost guaranteed to be approved. The only other credit cards we know of that has no credit check is the Opensky and Primor. Compared to the mainstream issuers like Discover, Capital One and Citi, this card also has no annual fee. Cards like the Discover secured are better in that they have a rewards program and you can get your FICO score for free. Capital One may only require a partial deposit. But the main advantage these cards have over the latitude is that you could potentially graduate to an unsecured card if you make your payments on time and when your credit score improves. Since First Progress (which is the firm behind First Latitude) only has secured cards, you cannot graduate to an unsecured credit card because they do not have any offerings in their portfolio. When your credit score improves, you have to separately apply for an unsecured credit card. To some folks, this might not be an issue because they have the intention of going unsecured as soon as possible without waiting for graduation (if their card allows that). Compared to issuers who are just dedicated to secured credit cards, the First Latitude Mastercard® Secured credit card shines because it is the only one (at this moment) that does not charge any annual fee. There are a couple of other issuers like Opensky, First Progress other cards and Primor that, like this card, has no credit checks. However, the advantage that this card has over these cards is that there is no annual fee. 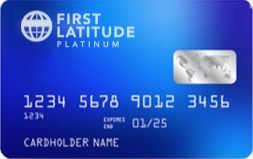 The First Latitude Mastercard® Secured Credit Card is the latest secured credit card that has no annual fee and that is a very welcome development. It means that secured credit cards are even more attractive to rebuilders. Many mainstream issuers like Capital One, Citi, Discover have secured credit cards with no annual fee. And they also offer the chance to graduate to one of their unsecured credit cards. In this aspect, they are better than the Latitude offering. However, not everyone gets approved for these cards. There have been many folks who have been denied from Capital One, Citi and Discover. If you have faced this, you next best alternative would be to look for a secured credit card that does not do any credit checks. The obvious choices would be the Opensky, First Progress, and Primor. These cards, however, come with an annual fee (though they are all reasonable). Now, you have a better choice in the Latitude card because it does not have any annual fee and it also does not check your credit. If you are a rebuilder looking to secured cards to rebuild, I would suggest going with the mainstream issuers first because you have the chance to graduate to their unsecured offerings. However, if you get denied, then the First Latitude Mastercard® secured credit card would be ideal for you to apply.